Last weekend, we had some friends over for an impromptu BBQ. I was kind of tired of the usual BBQ fare of [turkey] burgers and dogs with beer and wine, and wanted to do something a little more festive. For food, I bought some prepared, sesame-encrusted, tamari-seasoned, salmon fillets from our local grocery store — which I threw on the grill. I also threaded some Italian turkey sausage on skewers with pineapple and red onion — which I brushed with a mandarin orange glaze from Trader Joe’s. Both simple, yet not your same-old, same-old. I came across a recipe that not only sounded delicious, but one which I had almost ALL the ingredients for! How could I resist??? It was an Herbed White Sangria. I am all about herb and fruit-infused liqueurs and liquors right now… so this was an obvious choice for me. The herbs included both mint and dill! I was intrigued… and I had both growing in back yard, so it was perfect. 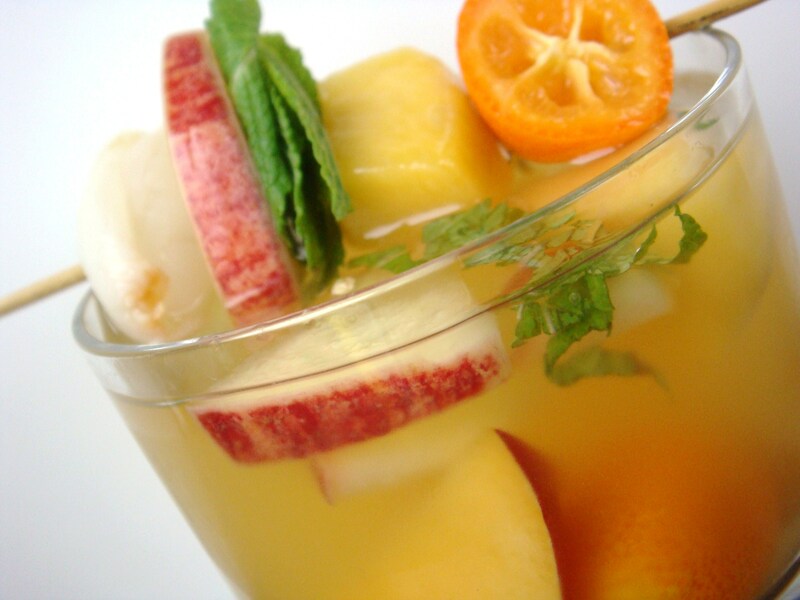 Combine the wine, apples, peaches and mango in a pitcher and cover and refrigerate for at least 1 hour. 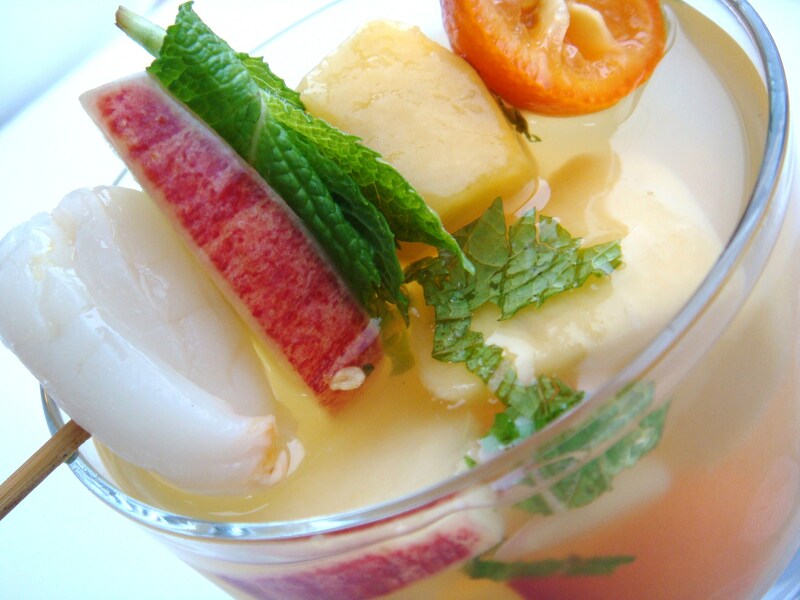 Stir in the passion fruit and lychee juice nectars, add the grapes and refrigerate, covered for another 1 hour. Stir in chopped mint and dill — for this step, since one of my guests is not a big fan of chopped-up herbs floating in her drinks — I actually used a large tea-ball that I have. It worked great! Serve over ice with dill sprigs as a garnish (I used passion fruit seeds). This herby, mango-specked sangria reflects Vermilion’s (in Chicago) Latin-Indian fusion philosophy: the drink was created for the restaurant’s 2005 Bollywood festival. NOTE: All the recipes in the book come from various restaurants throughout the US. This was hands-down one of the best, if not the best sangria I have ever had! It was SO fresh and the combination of the tropical fruit and herbs was amazing. I wasn’t sure how I would feel about the addition of dill, but it was actually one of my favorite things about the drink! It added an unexpected twist and layer that totally complemented the muskiness of the lychee and the sharp, tart bite of the passions fruit. Superb!